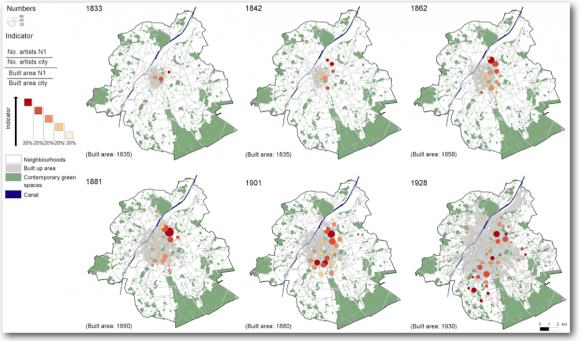 Based on detailed diachronic mapping, this article analyses artists’ areas of residence in Brussels from 1830 until today. Powerful spatial logic has taken shape over time, marking the appearance, decline and permanence of poles with a concentration of artists, which must be understood in the context of urban dynamics which have shaped the urban fabric. Three periods may be identified, corresponding to the development (or redevelopment) of specific areas in the city: the second half of the 19th century, associated with the urbanisation of artists’ suburbs in the northeast; the interwar period, characterised by concentrations on the outskirts; and the end of the 20th century, when the former southeast pole became popular once again, at the same time that new concentrations appeared in connection with the renovation of central areas. The mapping work and the results obtained provide an original view of the structuring of the artistic world in Brussels, while revealing the importance of a historical approach in the analysis of contemporary urban dynamics with artists in the spotlight. Sur base d’une cartographie diachronique détaillée, cet article analyse l’implantation résidentielle des artistes plasticiens à Bruxelles de 1830 à aujourd’hui. Des logiques spatiales fortes se dessinent au fil du temps, marquant l’apparition, le déclin ou la permanence des pôles de concentration d’artistes, qui doivent être resituées dans le contexte des dynamiques urbaines ayant modelé le tissu urbain. Trois périodes se dégagent, correspondant au développement (ou redéveloppement) d’espaces spécifiques de la ville : la deuxième moitié du 19e siècle, associée à l’urbanisation des faubourgs d’artistes du nord-est ; l’entre-deux-guerres, se distinguant par des concentrations plus périphériques ; la fin du 20e siècle, enfin, durant laquelle se redéploie l’ancien pôle sud-est, en même temps qu’apparaissent de nouvelles concentrations liées aux phénomènes de rénovation des espaces centraux. Le travail cartographique entrepris et les résultats obtenus apportent un regard original sur la structuration du monde artistique bruxellois, tout en révélant l’importance de la profondeur historique pour l’analyse des dynamiques urbaines contemporaines mettant en scène les artistes. Op basis van een gedetailleerde cartografie over langere termijn analyseert dit artikel de residentiële inplanting van de beeldend kunstenaars in Brussel, van 1830 tot vandaag. Er tekenen zich in de loop van de tijd sterke ruimtelijke logica’s af, die het verschijnen, het verdwijnen of de bestendigheid van artiestenconcentraties aantonen. Die logica’s moeten gesitueerd worden in de context van de stedelijke dynamieken die het stedelijke weefsel kneedden. Er tekenen zich drie periodes af die overeenkomen met de (her)ontwikkeling van specifieke ruimtes in de stad: de tweede helft van de 19e eeuw, verbonden met de verstedelijking van de noordoostelijke artiestenvestigingen ; het interbellum, dat gekenmerkt wordt door concentraties die meer in de periferie liggen; het einde van de 20e eeuw, wanneer de oude zuidoostelijk pool zich opnieuw ontwikkelt, en wanneer er nieuwe concentraties ontstaan die gelinkt zijn met de renovatie van centraal gelegen wijken. Het ondernomen cartografisch werk en de verkregen resultaten zorgen voor een originele blik op de structurering van de artistieke wereld in Brussel en toont ook het belang aan van historische diepgang voor de analyse van stedelijke dynamieken waarin artiesten een rol spelen. 1The spatial analysis of artistic phenomena is becoming increasingly widespread, as the science of art examines their spatiality and as geography encompasses cultural subjects. Geographers thus share the same concerns as culture historians, who were the first to focus on the presence of institutions and artistic stakeholders in cities. By examining this from a spatial perspective, they have found an original approach to the study of the city and its contemporary dynamics [Grésillon, 2008]. 2The focus of researchers has been centred in particular on the role played by artists in the renovation of central neighbourhoods and the large-scale examination – most often of a neighbourhood – of their pioneering position in launching the process [Cameron & Coaffee, 2005; Zukin, 1982]. However, the mapping of this spatial and dynamic phenomenon is rare: the few attempts carried out on the subject of artists [Charpy, 2009; Wedd et al., 2001] or art galleries and cultural infrastructures [Boichot, 2011; Molotch & Treskon, 2009] show the relevance of the approach, which sheds light in an original way on the structuring and transformations of the world of art and urban spaces. 3In this article we shall outline the geography of professional visual artists in Brussels, the country’s main art centre [Debroux, 2009]. 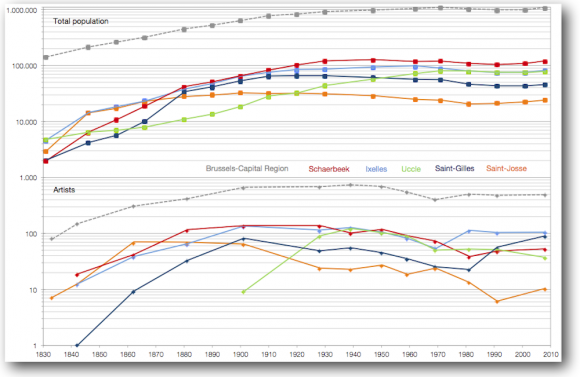 The study was conducted at the territorial level of the Brussels Region, and covers the period from Belgian independence until today; it documents the development of concentrations of artists and their evolution, throughout the city’s transformations (development phases, peri-urbanisation, urban renovation). Along with providing new knowledge about the structuring of the Brussels art world, in doing so, the empirical approach taken sheds a different light on the contemporary concerns related to the position of artists in urban contemporary dynamics. 4The identification of appropriate sources is the first step in analysing the presence of a population and questioning its spatial logic. As regards the professional group of artists, several factors complicate this research. 5Firstly, without limiting ourselves to the case of Belgium, very few authors have attempted this exercise, and even less so in a wide perspective of time. There is therefore no methodology to refer to: at the very most, the existing studies provide indications about the data which may be used. If the usual statistical sources provide little information on culture, the option of the long timeframe forces us to combine several information sources. 6In the case of Brussels, the only previous study dealing with the question of the spatial distribution of painters and sculptors was the one by Linda Van Santvoort, devoted to artists’ studios in the 19th century [Van Santvoort, 1996]. This work by an art historian with a rich inventory of heritage, examines the geography of artists via their places of work, identified in archives and municipal monographs, without claiming to be exhaustive and without a cartographic approach. 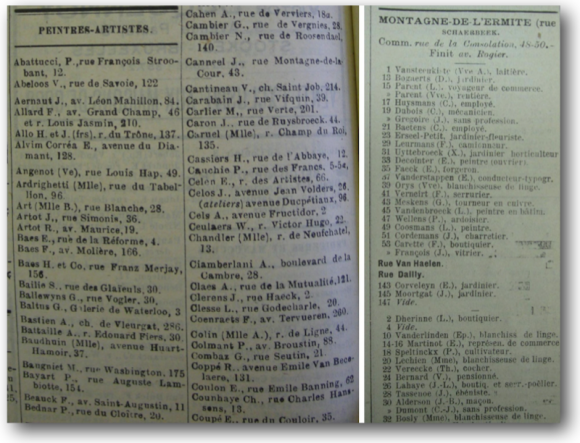 The works by historians conducted in other European capitals are based on exhibition catalogues and trade directories, such as those which existed in Belgium beginning in the 19th century. 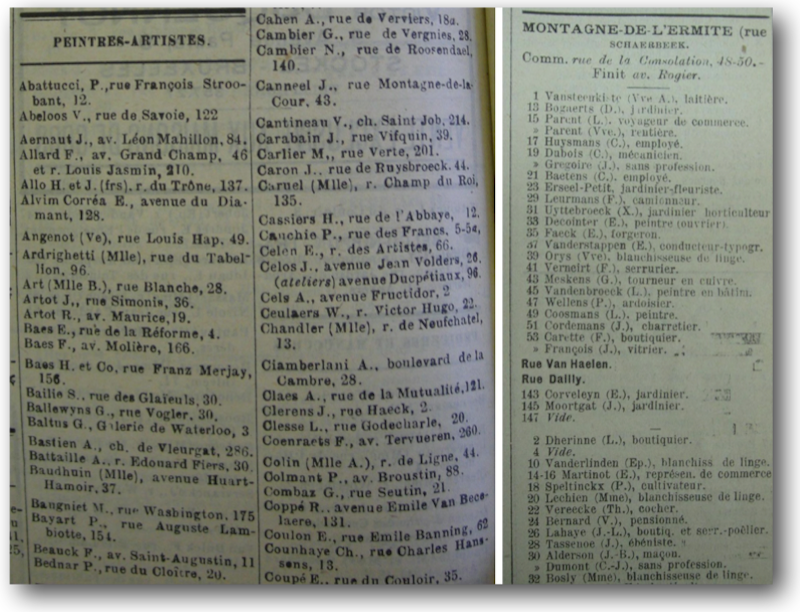 7It was therefore possible to make a census of a large number of professional artists living in Brussels as of 1830, based on the catalogues from the Triennial Art Fairs (1833 and 1842), the Trade and Industry Almanacs (between 1862 and 1969), and with respect to more recent data, based on population censuses (1981, 1991) and on data from the professional association SMart (2008).1 Compiled with different aims and with varying levels of exhaustiveness, these different sources all identify individuals according to their place of residence (registered address)2 and not of work (studio).3 They group visual artists according to changing terms and categories, which served as a basis in defining the population in the census. 8In total, some 6 000 addresses of artists were gathered, with the numbers changing according to the year; this of course does not include all of the painters, sculptors and contemporary artists who have lived or who live in Brussels, but nevertheless constitutes a representative and coherent sample in terms of cartographic results. 9Secondly, it involved locating the addresses gathered in the territory of Brussels, which spread and transformed throughout the period studied. Place names and roads have changed or disappeared, requiring much effort in order to locate them. Street maps and trade almanacs were vital for this, as they provide the composition of streets, house numbers and crossroads, thus allowing the artists’ places of residence to be located with precision (figure 1). Presented in three volumes, it allows professional categories and the composition of streets in the capital to be identified. 10The result of the previous step is a dot map, indicating the address of each artist on contemporary base maps (figure 2 provides a general idea). As it allows an understanding of the concentrations at regional level through an accumulation of dots, this method of representation also allows one to zoom in on certain parts of the territory. This process of analysis on a very large scale reveals an interesting phenomenon, which is known by art lovers and which is expressed in spatial terms. By observing the major concentration at the end of the 19th century, a clear alignment of artists’ houses emerged: these houses were on streets with a façade facing north, allowing a cold and steady light to fill the studios. G. Guffens’ studio, located at Place Lehon (*), provides an example of a north-facing window letting in the cold light. 11Representation at the address is however less efficient for estimating the relative significance of aggregates among themselves, or for bringing into perspective the presence of artists compared with the total population living in these areas. The option chosen in order to deal with this problem was the creation of an indicator, allowing a comparison of different neighbourhoods4 for which the number of artists was calculated. 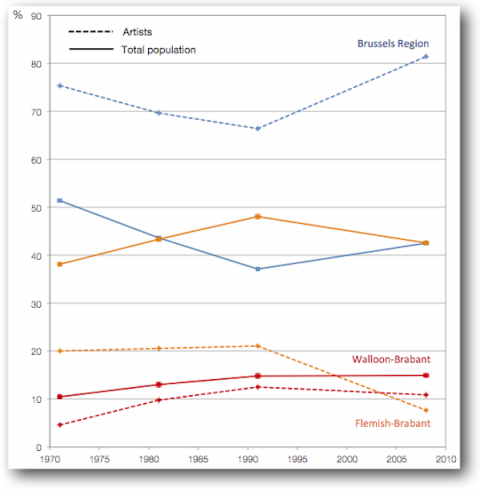 The relative importance of the neighbourhoods and the over- or under-representation of visual artists was estimated by comparing the percentage of built up area in the neighbourhoods in each period, for lack of historical demographic data suited to the spatial division used. The final result allows the significant concentrations of artists to be identified thanks to the size of the symbols and their hue. 12At the beginning of the studied period, the city of Brussels was still almost entirely contained in its second surrounding wall, replaced by boulevards which gradually became urbanised. It is therefore not surprising that artists’ places of residence were confined to the area known as the “Pentagon” in 1833 (figure 3). 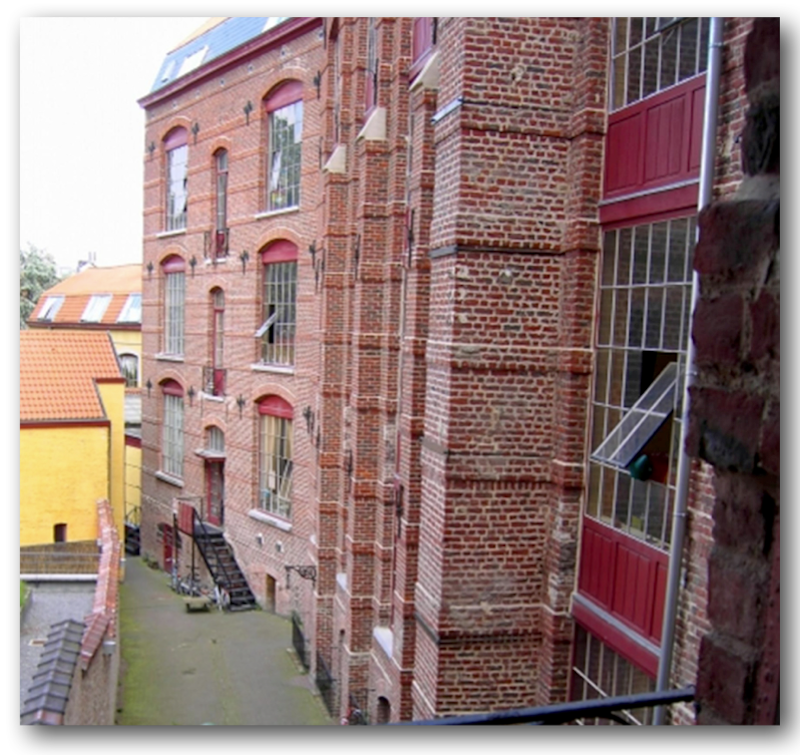 The 18th century legacy of the geography of artists was still seen at this time: with the headquarters of the guilds which governed all of the artistic production before the liberalisation of the professions of painter and sculptor, the historical centre of Brussels was still home to dozens of artists. However, the biggest concentrations were no longer seen there, in absolute and relative terms. The east side of the Senne valley was steeper and, historically, was the home of the Brussels elite, as well as being the location of the museum, the temporary location of the Academy of Fine Arts, and the home of artists who, by living there, expressed their high professional and social status while mixing with their wealthy clientele. This first map, and especially the one from 1842, carried the seeds of the later development of the geography of artists in the 19th century and its eastern tropism: as the number of artists increased and the city became more dense, the latter settled outside Brussels in the suburbs, at the same time that these areas were becoming urbanised. The neighbourhoods are classified in decreasing order in terms of specificity, and the classes divide the neighbourhoods into quintiles based on the number of artists. These quintiles are therefore established based on the specificity index and are weighted according to the number of artists; as such, the neighbourhoods are divided into five classes of increasing density in terms of the presence of artists, with 20% of the number of artists found in each class. 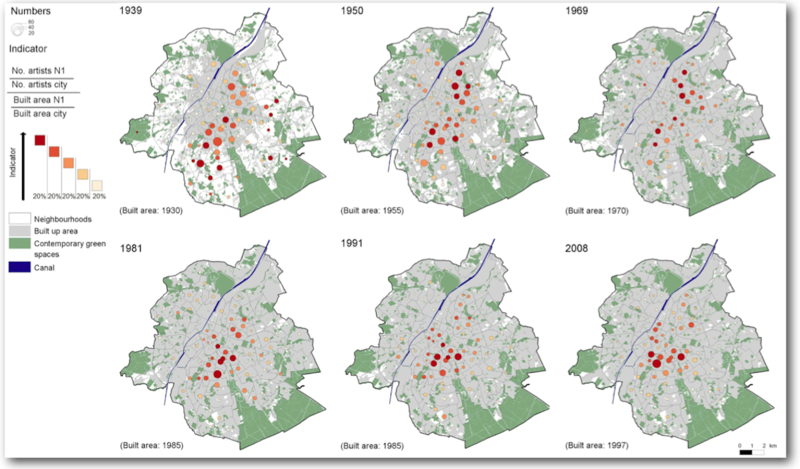 14The same phenomenon of distribution occurred twenty years later, towards the southeast and the suburbs of Ixelles and then Saint-Gilles (figure 5 shows the later growth in the population and above all in the number of artists between the two major poles of concentration, i.e. northeast and southeast). As was the case with the first suburbs they settled in, artists became established in middle-class neighbourhoods, which allowed them to combine contradictory constraints. These areas initially offered the possibility for cheap housing (financial accessibility), while being located just next to the Pentagon, the epicentre of Brussels cultural life (need for centrality). The middle-class suburbs which were being built also offered artists a green environment and easy access to the woods and fields surrounding the city, and were seen as a means to escape the sprawling industrial city. 15The search for nature – where artists set up their easels – also explains the evolution in their distribution during the first quarter of the 20th century. The appearance of the first maps and those from the interwar period was very different however: although the number of artists continued to grow, a phenomenon of dilatation of the area they settled in decreased the importance of the two poles. The neighbourhoods with the highest relative concentration were from then on located in the municipalities on the outskirts of Brussels, to the south and the east. Although they were not yet very urbanised, these areas were already home to wealthy families from Brussels. Circles were formed around art lovers or artists’ houses, providing opportunities for artists and clients to meet, and attracting artistic life to these distant suburbs. 16These concentrations on the outskirts of the city were significant during the interwar period, and later became less pronounced for different reasons. On the one hand, the access to property for artists in these areas became more difficult as they became home to affluent populations wishing to leave the crowded city in the 1950s and 1960s. On the other hand and more fundamentally, the period after World War II was marked by many transformations in the art world, in terms of the evolution in forms and techniques (portraits becoming more scarce, installations, beginning of monumental art, etc.) as well as education and the organisation of the art market (development of art galleries, contemporary art museums beginning to open). The presence of intermediaries between artists and their clients, as well as the change in their profile, lessened the need for artists to live near the wealthy and cultivated middle-class, as was the case before. 17The cartographic results reflect these transformations: at regional level, we observe a decrease in the number of visual artists, related to the change in the nature of the demand.6 On the other hand, rather than accompanying the upper and middle-classes towards the outside of the city from the 1960s onwards, artists apparently were not part of the phenomenon of peri-urbanisation, and remained in the city for the most part, where the historical poles once again became relatively more important (figures 4 and 6). 18The last three maps (1981, 1991 and 2008) are interesting, as they document the contemporary distribution of artists in an area familiar to us. They also allow an examination of the ties described in the urban literature between this particular professional group and the phenomena of the renovation of central neighbourhoods in Brussels. Several points should be noted. Firstly, apart from a rise in the number of artists (probably emphasised by a change of source), the neighbourhoods with the highest numbers are clearly located at the former southeast pole, in upper Ixelles in 1981, and then towards the municipality of Saint-Gilles, following a gradual shift from the east to the west. The second noteworthy point concerns the return of visual artists to the city centre, which they had left at the beginning of the 20th century. Initially, they were present at Sablon and close to the Grand-Place, and then moved to the northwest quadrant of the Pentagon, where they had never been present. This contemporary settlement, which is synchronous with and did not precede the processes of urban renovation, results from different factors, including those of centrality and economic accessibility. Added to these factors – which are not specific to artists alone but also to a new middle-class which shared the same constraints and tastes – are more specific urbanistic and environmental factors. These include structures which encourage the reproduction of concentrations as well as the artistic legacy of these areas at a symbolic level. 19When looking at two centuries of the geography of visual artists, the different phases of Brussels urbanisation appear, as well as the major changes in the art world. A long centrifugal logic associated with the gradual extension of the capital, directed towards the middle-class neighbourhoods in keeping with the new status of artists and their need to mix with their patrons was followed, at the middle of the 20th century, by a stopping in the process of spreading and a recentring at the poles of concentration which had existed in the previous century. They still mark the current geography of the group, but a significant shift took place, causing the southeast pole to dominate, which now coexists with new areas of concentration in the Pentagon. Different time-based logics are therefore juxtaposed, combining processes of emergence, permanence, withdrawal, abandonment and return: they correspond to different portions of the city, each of which has marked the geography of artists in Brussels. 20The development of concentrations of painters and sculptors in Saint-Josse and Schaerbeek constitutes the first striking fact in the geography of artists since their change of status at the end of the 18th century. The period in which these settlements took place explains their importance: on the one hand, the number of artists increased steadily throughout the 19th century due to the global demographic growth of Brussels, and above all to the attractiveness of the profession (elitisation of the status, extension of recruitment to the upper class, increase in the demand, education reforms, evolution in materials). On the other hand, the city was expanding rapidly and developing towards the eastern suburbs, initially in a northward direction. 21The first artists who lived near Porte de Schaerbeek attracted students in particular who had come to study in private studios. Although they were at the origin of the appeal which this part of the city had among artists, these first studios built in the middle of vast properties did not stand the test of time. Due to the death of these artists or to urban sprawl, these properties were often divided into smaller plots, and today there is no longer any trace of them. Nevertheless, in addition to the initial conditions which had attracted artists – affordable area close to the city and semi-rural environment –other factors followed, explaining the continued concentrations in the northeast pole and even their increase. 22Next to private studios, art schools for training new artists also opened and provided teachers with a regular income. In addition to training and the existence of studios used by artists, many other facets of artistic life developed, making these areas true artists’ neighbourhoods. The concentration of professionals was at the origin of the creation of circles and the organisation of local artists’ exhibits, famous in Schaerbeek due to the number of participants. 23In the last decades of the century, artists’ clientele were from the middle-class neighbourhoods they lived in or from other areas in the city, from where clients went out to visit studios. Formerly, the areas where painters worked and lived had a bad reputation, and later became popular places for socialising. After a visit to the studios, one may have gone to one of the shops which sold paintings, some of which had existed in Schaerbeek since the end of the century. Furthermore, there were shops selling art supplies near the artists’ studios: without a doubt, the most famous was the framer Félix Mommen, whose shop in Saint-Josse and the studios rented out to artists became places for socialising in the art circles of Brussels at the end of the 19th century, gathering visual artists, men of letters, journalists and art lovers. 24The conjunction of these different elements explains the lengthy existence of the northeast pole. However, a long lull followed the quick development (from 1900 for the small territory of Saint-Josse, and from 1930 for Schaerbeek), which distinguishes this area from its southeast equivalent. The reasons are linked to the general demographic evolution of the Brussels Region, as well as to the local specificities which differentiate the two areas. Both were abandoned by the middle-class in the 1960s. 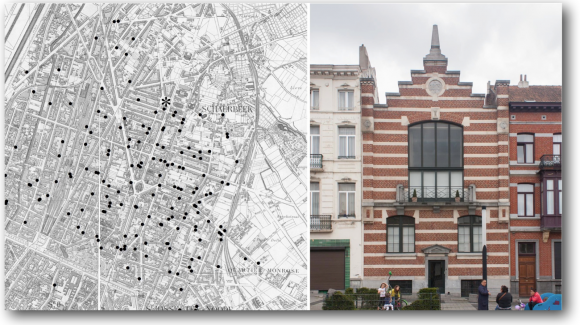 In the following decades, these impoverished areas experienced a different fate – the southeast pole attracted new middle-class households, initiating processes of renovation, contrary to the old neighbourhoods of Saint-Josse and Schaerbeek. In addition to material barriers which isolated these areas from the city centre and its cultural offer (building of Boulevard du Botanique and service sector development of the area northeast of the Pentagon after the war), there were symbolic obstacles which slowed down the return of the middle-class, including artists (pronounced spatial marking by a dominant community, opposed to the ideal of social mix (Clerval, 2010; Lévy, 1998). 25Although artists are still present in the northeast pole, Schaerbeek and Saint-Josse are no longer the lively neighbourhoods full of artists they used to be. Their memory nevertheless lives on in the street names, the organisation of an artists’ circuit in Schaerbeek and the recent renovation of the Studios Mommen, which recall the former suburb of artists. Beyond the gate of Rue de la Charité and the former shop of the framer Mommen, the thirty or so recently renovated studios/dwellings have a style of architecture which is unique in Brussels: that of an estate built in 1894 in order to provide artists with a place to work. BruS69/1 - Pôle Nord-Est - Noordoostpool - North-East pole from Brussels Studies on Vimeo. Works: “Le jardin Botanique ou Porte de Schaarbeek, construction des serres, 1826”, Alexandre Boëns (father or son), oil painting on oak, 1826 (photo Hugo Maertens, Collections Musée Charlier, Saint-Josse-ten-Noode). 27The settling of artists in the municipalities of the outer ring at the beginning of the 20th century reshaped the geography of artists in Brussels, and should be compared with a phenomenon which was once seen throughout Europe, namely that of rural colonies. With a desire to move away from the busy modern cities while remaining close to the market they represented, many artists settled temporarily in nature throughout the second half of the 19th century [Lübbren, 2001]. Around Brussels, examples of the most famous colonies are the Tervuren School, the Rouge Cloître colony at the edge of the Sonian Forest, and the artists who went to paint in the Valley of Artists in Linkebeek [Van de Putte, 2009]. Thanks to the paintings they made there, these painters contributed to the popularisation of these peri-urban areas and prompted their middle-class clientele to visit these areas, as they found that walking and enjoying the landscape was a means of cultivating the body and the mind. 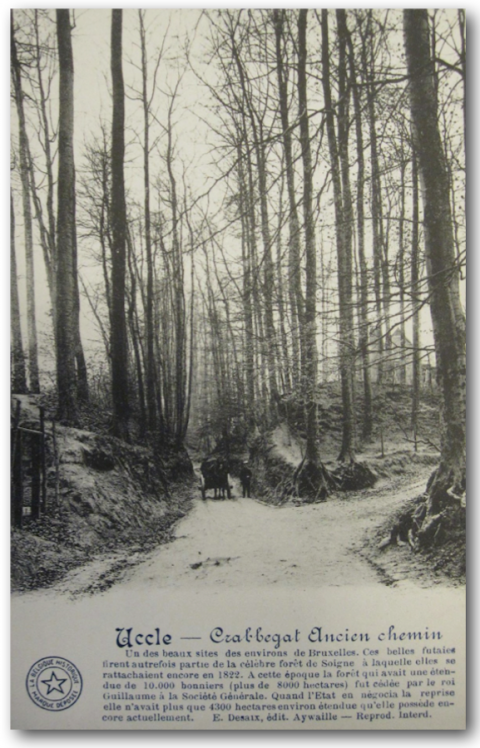 The members of Uccle Centre d’Art, some of whom lived near the lane in a very rural environment, took action to protect it when there were proposals for a housing estate project in 1924. 28With the development of by-roads, tramways and buses, a new phase was taking shape. From then on, it was possible to go to the city centre, with all of its places to visit and its art sellers, while living outside the city in the villages along the roads leading away from it. The settling of artists in the southeast quadrant of the city is explained not only by a phenomenon of diffusion from the old concentrations, but also by the presence of wealthy individuals in these areas – industrialists and bankers – who were often art lovers and collectors, and who allowed their houses to be used for art events (the Van Buuren couple are a famous example). Furthermore, art networks were formed around several key figures and their houses – Constant Montald in Woluwé-Saint-Lambert, Auguste Oleffe in Auderghem and Henry Van de Velde in Uccle. The latter location is a very interesting example due to the large number of artists who settled there and participated in local cultural life. 29Founded in 1922 in a tavern located at the bottom of the Crabbegat, the Uccle Centre d’Art circle played an important role in recognising artistic activity in a landscape which was still very rural and picturesque, as well as in preserving the Uccle environment, both in terms of its nature and its buildings. The mobilisations of artists, supported by eminent patrons, illustrate the amplifying role played by artists with respect to the ideas held by the enlightened middle-class at the time. By highlighting the city’s surroundings through their works and by promoting a model of life and leisure among their clientele, artists played the role of adviser. They influenced practices and thus sustained the fad for peri-urban living which became more pronounced in the municipalities of the outer ring beginning in the 1920s, and above all after World War II. 30Due to the growing urbanisation of these areas and the increase in housing prices – in addition to a renewed interest of visual artists for the city in the second half of the century – the concentrations diminished on the outskirts of the city. Their existence and especially their significance in the Brussels art world were therefore relatively brief, but marked an original phase in the geography analysed, during which artists contributed indirectly to accelerating the urbanisation of the suburbs in the outer ring. BruS69/2 - Verte banlieue - Groene voorsteden - Green suburbs from Brussels Studies on Vimeo. Works: “Les environs de Saint-Job”, Juliette Wytsman-Trullemans, oil on canvas, circa 1900 (photo Hugo Maertens, Collections Musée Charlier, Saint-Josse-ten-Noode); “Le Kamerdelle, Uccle 1925”, Henri Quittelier, engraving no. 4/350, 1925 (Bibliothèque des Musées royaux des Beaux-Arts de Belgique). 32The originality of the artists’ neighbourhoods in the southeast resides in the longevity of the initial concentrations, and especially in their dominance in the geography of artists over the last thirty years. 33The concentration of painters and sculptors in the suburbs of Ixelles and Saint-Gilles developed initially around Porte de Namur, and was structured with the building of Avenue Louise in 1862. This prestigious road was an extension of the royal route in the direction of Bois de la Cambre, and was lined with the big mansions of wealthy families. These upper middle-class families were often not religious, of independent means or exercised a profession, and were progressive and cultivated; they intended to distinguish themselves from conservative polite society in terms of values and aesthetic tastes by mixing with and supporting artists (which, as it were, legitimised their affluence and their social position). The spatial proximity between the artists and their middle-class clientele at the end of the 19th century was therefore based on self-interest, which established the social status of the two parties. However, it was rare for artists to live on Avenue Louise itself. A more detailed scale shows that the visual artists at this time lived behind the avenue, in the adjacent streets, as well as along Chaussée de Charleroi, the backbone of the urbanisation of upper Saint-Gilles. As was often the case in Brussels, there was a contrast between the prestigious streets and their immediate surroundings, which did not share the same socioeconomic status: this made it possible for artists at the end of the 19th century to live near their clientele and for these two groups to mix in their daily environment. 9 L’Art Moderne, 1898, No. 31: 243 / No. 32: 256. 34In the 20th century as well, Avenue Louise and Chaussée de Charleroi played an important role in the structuring of the geography of artists in Brussels, not with respect to its residential dimension, but to the distribution of art works. Historically, Avenue Louise is one of the areas in Brussels with a concentration of art galleries, with their numbers beginning to rise in the 1950s. Although the pattern of their locations is based on a logic other than the distribution of visual artists, in some cases their existence is related to the presence of artists and currently contributes to the identification of neighbourhoods where they are concentrated. 10 Translated excerpt from the newspaper Le Soir, 17 January 1991. 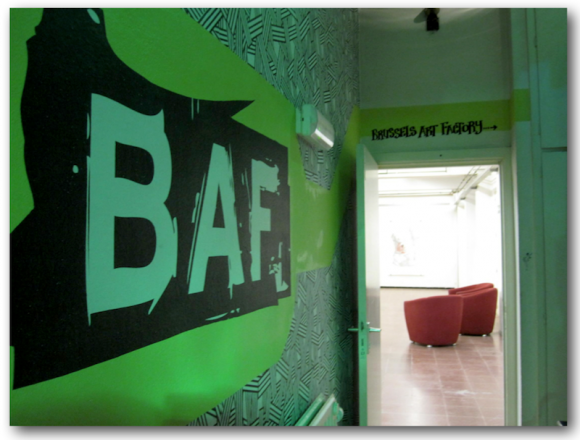 Since 2011, fifty or so visual artists have been working at the Brussels Art Factory (Saint-Gilles), an artistic production and diffusion centre which they helped create. BruS69/3 - Pôle Sud-Est - Zuidoostpool - South-East pole from Brussels Studies on Vimeo. 36Other elements have had the same role in the past (a municipal museum) or have contributed to the reproduction of the southeast pole in the long term (schools – Academies of Fine Arts in Ixelles and Saint-Gilles, Saint-Luc, La Cambre). Their presence, the special typology of the buildings (architectural quality, buildings inside the blocks) and the existence of places for socialising, thus structuring life in the artists’ neighbourhoods (studios, fairs, cafés, exhibit halls), explain why these residential concentrations still exist, despite the change in the initial conditions. Faced with the evolution in real estate value in particular – which was advantageous at the time of the urbanisation of the southeast suburbs and then during their revival in the 1970s and 1980s – the old artistic aura and above all the presence of peers (a guarantee of social networks favouring professional recognition) have played an important stabilising role in the geography studied. Although there was clearly some inertia involved in the existence of the southeast pole, a shift of artists towards the west occurred during the last thirty years, due to the transformation in the material and symbolic environment of the historical artists’ neighbourhoods as a result of urban dynamics. 37Artists represent a small yet singular group which experienced a significant evolution in its socioprofessional status over the past two centuries, and today attract the attention of researchers and the city’s stakeholders, who question the transforming power of their presence in the central neighbourhoods, and the possibility to channel it. The study of the geography of visual artists shows that their current distribution is the result of a long historical accumulation, marked by spatial permanence, abandonment, changes in polarities and the emergence of new areas. As a reflection of a social position which is both prestigious and precarious, this geography is also elitist and marginal (to use the words of Heinich, 2005), highlighting middle-class areas undergoing urbanisation, or old neighbourhoods undergoing social transformation. In Brussels, the distribution and temporality of the artists’ places of residence with respect to these phenomena call into question the discourses which consider them as pioneers of urban transformations. Although they participate in the aestheticisation of the areas they live in and thus in all likelihood play a role in their attractiveness in the eyes of other populations, their presence is not the deep cause of these transformations, for which they act as indicators [Vivant & Charmes, 2008]. 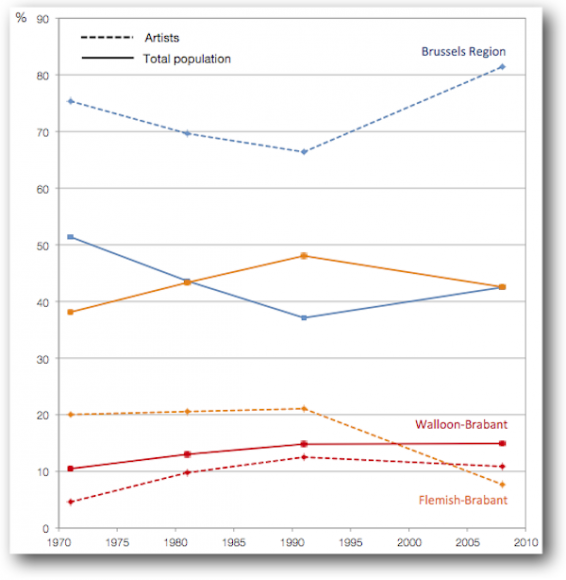 38Today, “where the artists are” corresponds to areas with favourable conditions for visual artists to live there at the end of the 1980s, during their development (or their re-emergence). The absence of strong competing urban dimensions, the presence of elements attracting the artists and others ensuring the reproduction of concentrations are at the basis of current artists’ neighbourhoods. The social and spatial structures inherited from the city’s past represent part of these favourable elements and undoubtedly explain the permanence of the southeast pole brought to light by the series of maps. 39These structures may however change and the once favourable elements may be threatened by the development of other dimensions (offices, luxury housing, etc.) or the arrival of other social groups, which weaken the old concentrations. For such reasons, the former northeast pole has become an area “where the artists are no more”, just as their presence has decreased in the neighbourhoods which have undergone renovation processes. Elsewhere in the city, “where the artists are not” (but where larger numbers of them could have been expected at times, such as on the left bank of the canal), the existence of factors of significant functional and symbolic avoidance, added to the absence of a historical location of artists, explain why artists are not present or are hardly present. 40The geography described raises many questions which are broader than the contemporary concerns of the creative city, yet are also able to echo the latter. 41Considered due to its age, the large number of representatives and the fact that it is studied most, the category of visual artists is not sufficient to document the current urban transformations. Other disciplines (in particular the performing arts) and dimensions (such as places of creation or rehearsal) deserve to be taken into account to complement the results obtained or to qualify them. 42Furthermore, it would be interesting to compare the geography of artists to the distribution of galleries, which have also been shown to be in keeping with the processes of urban renovation, or whose distribution in the past may have corresponded with the residential concentrations of artists. The analysis of the juxtaposition of different uses of space – residential, training, consumption, socialisation – would allow us to question the existence of true artists’ neighbourhoods in Brussels over the long term. 43The use of a small scale of spatial analysis and a long time-based perspective in the end allows the contemporary geography of artists to be put into perspective and into a new context through the prism of its past developments. Conversely, the comparison of different periods of urban development prompts one to question the historical transposition of the phenomena currently studied, whether they concern the internationalisation of the local art scene, the capacity of artists to reuse spaces and buildings, or the instrumentalisation of their presence by public or private stakeholders for urban redevelopment purposes. In so doing, it is possible to reconsider the past from an original perspective, to reveal the contemporary specificities of the presence of artists in the city and to question the models of redevelopment used. BOICHOT, C., 2011. Centralités artistiques et recomposition des espaces urbains : les enjeux d’une géographie de l’art à Paris et à Berlin. In: Mondes du Tourisme. 2011. September, pp. 350‑361. CAMERON, S. and COAFFEE, J., 2005. Art, gentrification and regeneration – From artist as pioneer to public arts. In: European Journal of Housing Policy. 2005. Vol. 5, No. 1, pp. 39‑58. CHARPY M., 2009. Les ateliers d’artistes et leurs voisinages. Espaces et scènes urbaines des modes bourgeoises à Paris entre 1830‑1914. In: Histoire Urbaine. 2009. No. 26, pp. 43‑68. DEBROUX, T., 2009. Géographie des artistes dans les régions urbaines en Belgique. In: Belgeo. 2009. Vol. 2, pp. 119‑136. GRESILLON, B., 2008. Ville et création artistique. Pour une autre approche de la géographie culturelle. In: Annales de Géographie. 2008. Vol. 660‑661, pp. 179‑198. HEINICH, N., 2005. L’élite artiste. Excellence et singularité en régime démocratique. Paris: Gallimard. LEVY, J.-P., 1998. Postface. In: HAUMONT, N. and LEVY J.-P. (dir. ), La ville éclatée. Quartiers et peuplement. Paris: L’Harmattan. pp. 251‑256. LÜBBREN, N., 2001. Rural artists’ colonies in Europe, 1870‑1910. Mancheste: Manchester University Press. MOLOTCH, H. and TRESKON, M., 2009. Changing art: SoHo, Chelsea and the dynamic geography of galleries in New York City. In: International Journal of Urban and Regional Research. 2009. Vol. 33, No. 2, pp. 517‑541. VAN DE PUTTE, E., 2009. Les peintres de la Forêt de Soignes. Brussels: Racine. VAN SANTVOORT, L., 1996. Het 19de-eeuwse kunstenaarsatelier in Brussel. Doctoral thesis in art history. Brussels. Vrije Universiteit Brussel. VIVANT, E. and CHARMES, E., 2008. La gentrification et ses pionniers : le rôle des artistes off en question. In: Metropoles. 2008. Vol. 3, pp. 29‑66. WEDD, K., PETTZ, L. and ROSS, C., 2001. Artists’ London – Holbein to Hirst. London: Merrell. ZUKIN, S., 1982. Loft living. Culture and capital in urban change. New Brunswick: Rutgers University Press. 1 Created in Brussels in 1998, it provides advice, training and administrative, legal, tax and financial tools to simplify and legalise the professional activity of artists and creation professionals (www.smartbe.be). 2 Although the information would of course be relevant, the sources unfortunately do not allow us to differentiate between artists who were tenants and those who were property owners during this period. 3 The vogue of artists’ houses with a studio in the 19th century and contemporary statistics on the place of work nevertheless suggest that the geography of these two types of space greatly overlap. 4 Neighbourhoods defined in the framework of Neighbourhood Monitoring, acting as a spatial frame of reference for the entire period (www.monitoringdesquartiers.irisnet.be). 5 This is especially the case for sculptors, whose pattern of locations differs from that of painters, who settled more often in the suburbs. 6 Although the downward trend emerged in 1950 and continued for several decades, here it was reinforced by the nature of the source (in particular for 1969), as trade directories were less pertinent for taking a census of artists. 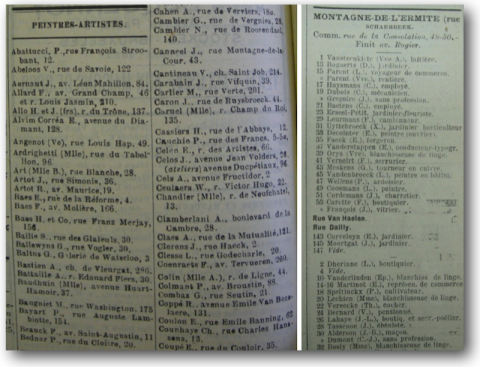 7 Translated citation from L’Art Moderne, “Revue critique des arts et de la littérature, paraissant le dimanche” published in Brussels between 1881 and 1914, at a time when the Brussels press bore the colours of the artistic groups and ideals which they supported. Excerpt from 10 May 1891, No. 19: 150‑151. 8 Translated excerpt from an unidentified clipping from the archives of the Uccle Centre d’Art (found at the Uccle town hall). Article from 2 September 1933. Tatiana Debroux, geographer, is a researcher at Université libre de Bruxelles where she coordinates MICM-arc research (culture, mobility and metropolitan identity). As a continuation of her thesis on the geography of artists in Brussels in relation to urban dynamics, she focuses on developments in the artistic scene in Brussels and its internationalisation, in an analysis of the position, assertion and transformations of a small cultural metropolis. On this subject she has published “Géographie des artistes dans les régions urbaines en Belgique” (Belgeo, 2009/2).